Fake planes, replicas and models are not listed here, only real planes. 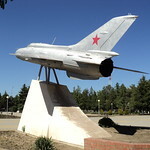 The natural model of a jet fighter BI-1 manufactured in the company MKB Raduga, a leading designer Mel'nikov O. V.
The aircraft MiG-21PFS is a gift from regiment's colleagues to co-citizens of G. Ya. Bakhchivandzhi. 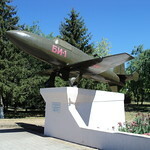 Memorial is situated at birthplace of the Hero of Soviet Union test pilot Bakhchivandzhi Grigory Yakovlevich. Pioneer of the jet age, he made the USSR's first flight on the aircraft "BI-1" with liquid rocket engine.